Back in 2015, Golf Pad ran a highly successful Kickstarter campaign for its Tags system. Now, the tracking product is used by thousands of golfers around the world. As an Android-only system, though, iPhone users have been left out. Golf Pad’s new Link system is their answer. The biggest difference between Link and Tags is its compatibility with both iPhone and Android phones. Better yet, Link keeps track of the entire game without needing the phone to be on the golf course. Each swing is recorded to the Link and when the golfer’s phone is in range, the data will automatically sync up. By removing the need for constant connectivity, the Golf Pad Link becomes a much freer experience. Essentially, the Link is a small, wearable device that clips to a user’s belt or fits in their pocket. 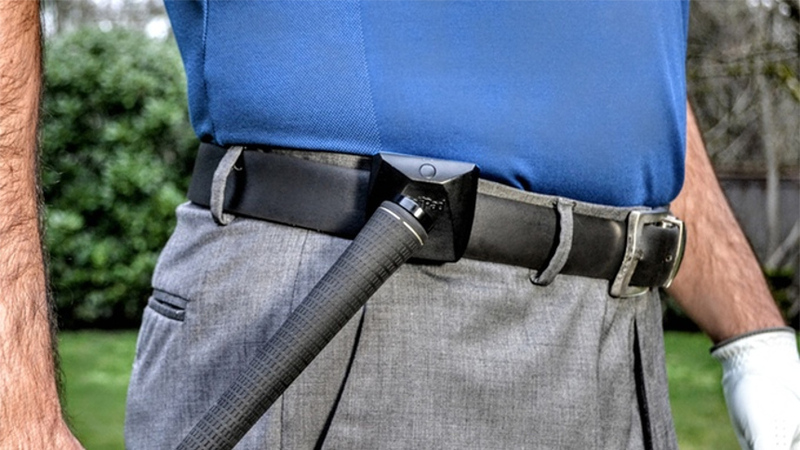 Besides recording golf swings, it also contains high-accuracy location sensors. Using GPS and GLONASS satellites simultaneously, the Link is able to a get a consistently accurate reading. This has the added benefit of saving phones from having to use a lot of their precious battery power. With a single charge of the Link’s battery lasting two rounds of golf, there is no worry of it running out halfway through. Each Link system comes with one wireless reader and 15 lightweight tags that screw into the ends of your golf clubs. Every tag has its own identity, so once it is paired with a specific club, Golf Pad will recognize it with every use. Before each swing, just tap the Tag to the Link to begin recording. The reader will vibrate to confirm that a successful and an optional confirmation tone can play from your phone. Additionally, users with an Apple Watch, Pebble, Samsung Gear, Android Wear, or Magellan smartwatch can get the confirmation directly on their wrist. Once a stroke has been made, a number of statistics are tracked automatically. These include club distances, strokes gained, shot dispersion, fairways hit or missed, greens in regulation, distance trends, scoring analysis, course strategy, and putting. After a couple rounds with the Link, the Golf Pad app will begin making recommendations on which club should be used. The app uses a sophisticated algorithm based on distance, temperature, humidity, and more to make its choices. The more you golf, the smarter Golf Pad becomes about your performance. Golf Pad Link is currently available on Kickstarter for $139. For anyone who already uses the Tags, the Link reader can be purchased separately for just $99. With the Link almost doubling its pledge goal, shipments are expected to go out this coming May.